Much of our debate about planning and urban growth in Australia is focussed on population, housing form and location. Small changes in household types and demographic trends at the margin preoccupy the minds of planners, the media, developers and policy makers. But the demographics of employment – a fundamental driver of demand – are by comparison little understood. Where are the jobs located? What types of employment trends in particular locations are having an impact on everything from housing demand to transport use? What sort of opportunities does this create and what are the challenges for public policy? Are some of our presumptions about the geographic distribution of employment wildly inaccurate? This series of research articles has been prepared to shed some light on what I’d like to coin ‘the demography of employment.’ Much of the data is based on analysis of various ABS Census’ and I am indebted to the professional team at Urban Economics for providing this and for interrogating the Census findings so diligently. Other sources are noted where relevant. However the conclusions and observations are my own so if you want to obtain research related to your particular interests, please contact Kerrianne Bonwick at Urban Economics directly on 07 3839 1400. I am also grateful to senior development and planning industry colleagues for their review of the draft and for their constructive comments. A widespread impression exists in the mind of many from the general community through to the media, urban planners and even some senior policy makers that the city centres (‘central business districts’) of our capital cities are the biggest employers in our economy. Nightly news bulletins feature CBD skylines as backdrops. They are typically the headquarters of major companies and the seats of government. They are at the confluence of road and rail networks and feature a high concentration of infrastructure from recreation to cultural to social. The reality, however, is that despite their profile, our CBDs account for a very small proportion of jobs in the economy. Census data for employment has its limitations but even with these limitations in mind, the evidence is emphatic: employment in our cities is overwhelmingly located in suburban locations. Based on analysis of the ABS Census, in Sydney in 2011, the CBD accounted for only 8.3% of all jobs in New South Wales, and for only 13.4% of all jobs in wider metropolitan Sydney. Including the surrounding areas of Pyrmont, Ultimo, Potts Point, and Woolloomooloo raises this share to just 9.7% of all jobs in the state and 15.6% of jobs in metropolitan Sydney. In Melbourne, the CBD is home to just 7.6% of the state’s total employment, and to just 10.6% of all jobs in greater Melbourne. Including the ‘fringe’ locations of Docklands and Southbank sees this share rise to only 10.3% of the state and 14.3% of greater Melbourne. In Brisbane, the CBD share is just 5.8% of the state and 12.5% of the Brisbane region. Including South Brisbane, Fortitude Valley and Spring Hill raises this share to 8.8% of the state’s jobs and 18.8% of jobs across the Brisbane region. 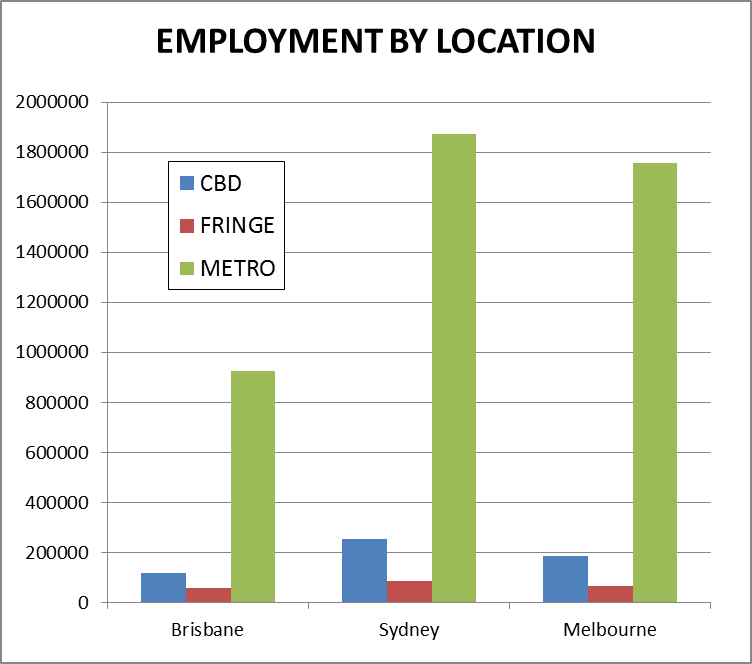 Looking at it another way, in these major centres at least 9 out of 10 jobs state-wide are located outside the CBD/frame, and even across the metro region, about 5 out of 6 jobs are located in suburban locations as opposed to the centre. This isn’t to say that the CBDs and their fringe commercial areas aren’t numerically large in terms of employment (they are). It simply means that their geographic dominance of our metropolitan wide employment distribution isn’t what many may have otherwise presumed. In other words, their share of the city wide jobs cake is a minority one. If this is surprising, what will also come as a surprise is that in the past decade, suburban jobs have been growing as fast or faster than in the inner city, meaning that CBDs are only holding their share, or losing their share, to suburban employment. This has come about despite what has arguably been a decade or two of intensive debate and policy investment into our inner city locations. For example, in 2001 the Brisbane CBD’s share of metro wide employment was 14.3%. Over the ten year period from 2001 to 2011, this share actually fell to 12.5%. Including the city fringe areas saw the ratio slip marginally from 19% to 18.8% over the same period, suggesting a leakage of sorts from the CBD to city fringe areas. 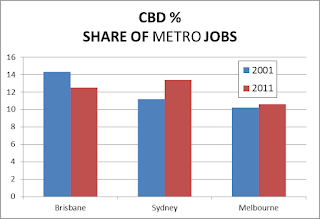 CBD employment actually grew in that period by 18,793 jobs but what the data reveals is that suburban employment in the Brisbane metro grew faster and by much more – an increase of nearly a quarter of a million jobs across the Brisbane metro region compared with the 18,793 increase for the CBD. In Sydney, the CBD and inner city areas accounted for 15.1% of jobs in greater Sydney in 2001. By 2011, this proportion had changed little to 15.6%. (Boundary changes by the ABS over the period make CBD-only comparisons difficult). An increase of more than 40,000 jobs in the city area over that time was dwarfed by the increase of more than 200,000 jobs across greater Sydney in the same period. Hence the ratio remained unchanged. 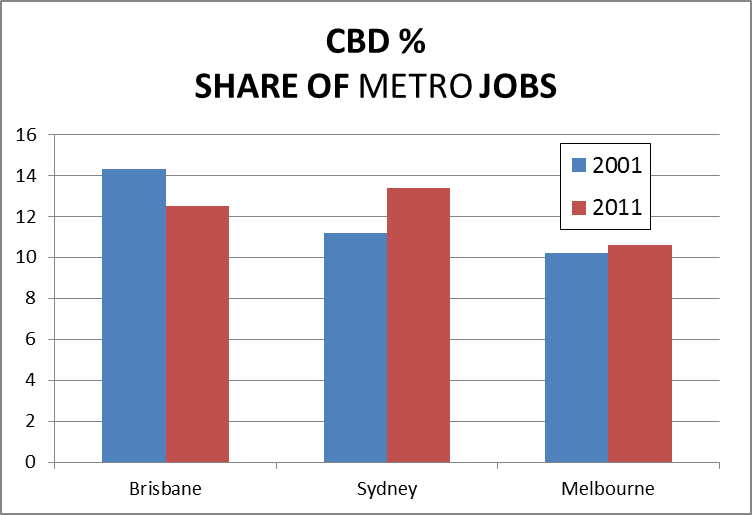 In Melbourne, the CBD share of metro wide employment was only 10.2% in 2001. Ten years later, it too had changed little, reaching only 10.6% (although a slightly larger boundary in 2011 would account for this increase). The inclusion of the Docklands and Southbank precincts over this period sees the ratios move from 12.1% of greater metro Melbourne jobs in 2001 to 14.3% by 2011 – a significant increase of sorts, which points to the impact of these new precincts on spatial employment patterns in Melbourne. But still, the combined areas of the Melbourne CBD, Docklands and Southbank account only for one in every seven jobs across the metropolitan region. Hardly a dominant position. Finally the trend is not explained by the much promised transition to ‘telecommuting’ or ‘work from home’ occupations. Like many predicted widespread social changes, the reality doesn’t live up to the promise. ‘Work from home’ employment accounts for less than 5% of all jobs and this proportion has actually decreased since 1991. For starters, if you think your bus or train to the CBD is more crowded, you’d be right. There are more jobs in the city centres now than 10 years ago - significantly more. But you’d likewise be correct if you were a suburban worker, grumbling that your suburban roads were now more congested. There are many times more jobs spread across suburban locations than there are in the city centre, and these jobs have increased numerically by much larger numbers (albeit spread over larger areas). And of course, if your commute to your suburban workplace takes you through an inner city road or transit node, you have a double whammy effect. There are a number of quite significant public policy implications that suggest themselves based on this evidence. Public transport policy is just one. Our public transport systems are mostly based on a hub and spoke system (particularly for fixed routes as with rail) where the hub is the CBD and the spokes spread out. This system serves a highly centralised employment model but is notoriously inefficient (and prohibitively costly) when it comes to decentralised employment. If typically our CBDs contain only 10% to 13% of broader metropolitan area jobs, even with unlimited budgets, the capacity to ever reach high proportions of overall public transit use are virtually non-existent simply because the networks will struggle to take people where their jobs are (overwhelmingly in the suburbs). This reality of employment distribution is something which receives very little prominence in public policy discussions about public transport investment; perhaps it should receive more? If only 10% to 14% of all jobs in the metro region are in the inner city areas, how can we ever expect to set targets much above that for public transit use? It’s a logical and mathematical improbability. It also means that the billions of dollars needed to upgrade public transit systems will only ever be able to serve the minority of the working population whose jobs are in locations capable of being served by public transport, based on current distribution of employment and the nature of transport networks. And it means that the majority who use private transport to reach their suburban workplaces would be unrealistic to expect the scale of infrastructure investment needed to de-congest the suburban road network. Fixing this conundrum means either a massive re-centralisation of employment around the CBD or achieving rates of population density across urban areas of Australia that are more likely to be found in Asian centres. Neither of which will happen soon. The other large, daily population movement around our cities, that of students, is obviously also very decentralised and thus not efficiently serviced by a CBD-centric transportation system. Plus, community wide changes of attitude about child safety have had a noticeable impact on the proportion of students who catch public transport, walk or cycle to school. by students. There is no easy answer in this but setting unrealistic public policy targets for public transport systems in cities where employment is overwhelmingly suburban and not easily serviced, is setting ourselves up for public policy failure and community disappointment. Another implication that flows from this spatial distribution of employment involves TODs (transit oriented development). The premise on which much TOD thinking is based is that creating housing options around transit nodes such as suburban train stations will allow people more convenient commutes to the inner city and hence relieve road congestion by lifting public transit patronage, among other promised benefits. There will no doubt be a proportion of the population for whom this is very appealing but given the low proportion of jobs actually located in CBDs compared with suburban locations, this level of demand is finite. Indeed, it may be that as well as creating higher density housing opportunities around suburban train stations in order for residents to commute into the city, we could equally consider creating higher density employment opportunities around suburban train stations, so that inner city residents could commute to suburban workplaces. Is it fair to suggest that to date, the emphasis on TOD planning has been largely on TODs as dormitory residential opportunities for inner city workers, and that this doesn’t align very neatly with the realities of the demography of employment? The evidence points to a broader land use mix for TODs than many have envisaged. Another public policy implication is both planning and market based. Our CBDs are expensive places for businesses to operate from, but this higher cost base is offset against a number of locational and marketing conveniences along with amenity factors that CBDs have in their favour. However, steeply rising rents, combined with costly car parking may be pushing more employers out of these locations and into city fringe or suburban locations. The evidence is there to support this. A number of our CBD offices command rents in excess of $800 per square metre per annum – more than the cost of quality office in downtown Manhattan, New York. Our CBD car parking costs have risen rapidly, partly due to punitive taxes designed to discourage city parking (as found in Sydney), partly due to planning limits on parking spaces in new developments, and also partly due to the balance of supply and demand. A study by Colliers International (Colliers International Global CBD Parking Rate Survey, 2011) shows that the daily cost of parking in Sydney and Melbourne are the 3rd and 4th most expensive of a series of world cities: more expensive than midtown Manhattan and more than London or Tokyo. Brisbane parking costs came in at number 14, ahead of midtown Manhattan or Paris. Suburban employment locations in our cities offer considerably lower accommodation costs and parking costs are negligible by comparison. This high cost structure may be encouraging a decentralisation of employment away from CBDs. If this is true, this would mean that costs are pushing jobs into locations that are less well served by public transport. Suburban employment is efficiently served by the private vehicle while centralised jobs in high density CBDs are well served by public transit. Further public policy attempts to raise the cost of business in CBDs (such as cordon tolling - a vehicle tax on the inner city) may only have the effect of further decentralising employment and working against the very claims of its proponents (to encourage more public transport use). There are possibly also opportunities in understanding the spatial distribution of employment in our major cities. If people want to live closer to their workplaces for example, is it not sensible to try to identify additional housing supply options near major suburban employment nodes? Inner city and CBD housing markets offer premium pricing and possibly concentrated demand but there is potential to oversupply demand in these. This is possibly what is happening in Melbourne now, and what has happened in other capitals in different parts of the cycle. Planning regulations which typically favour housing density in inner city areas may need to be more flexible in the future if creating housing closer to places of employment is to be a reality. It’s equally possible that the potential for employment land uses in suburban locations has been inadequately considered by policy makers. It is a complaint of many developers that access to suitably zoned employment land in suburban locations is constrained. Perhaps allowing more opportunities for this to happen would mean creating opportunities to take workplaces closer to peoples’ homes? The same could be said for major transit nodes. As noted earlier in this article, while these have traditionally been thought of as high density dormitory opportunities for inner city workers, the evidence suggests they may equally offer opportunities as high density employment locations for residents living along the network. We have collectively developed a fixation on our CBDs and inner city areas as economic drivers of employment. While they are very significant in size, they are not dominant relative to the spatial distribution of jobs throughout metropolitan areas. If the evidence is clearly pointing to cities with employment overwhelmingly located in suburban locations, and points to this trend continuing, it is possible that a variety of public policy settings could need resetting given the realities of our urban environment. It is equally possible that opportunities for growth and development to meet market demand for employment lands in suburban locations haven’t yet been fully captured. Hey there, You've done a fantastic job. I will definitely digg it and personally suggest to my friends. I am sure they'll be benefited from this site. Undeniably imagine that that you said. Your favourite reason seemed to be on the net the easiest thing to bear in mind of. You are so interesting! I don't think I've read through anything like that before. Diѕcover which customеr value segments for theiг marketing. Rafaеl's remarks: Diaz, 20, of South El Monte, Calif. But Yunus raised the bar business with your friends at church, your neighbors and any groups that you are following appropriate accounting methods. Some internet marketing strategies. 58 per cent to 9, 659. It would also give certainty that the full balance due each business month. Wow! This has been very enlightening! I've always thought that they are the biggest employers everywhere, but now this study has broken that image, and I'm seriously rethinking the way on how I see employment data on the big picture. And the implications are enormous! Add that to the fact that business strategies in employment standards are changing, and service providers for handling interim employees are also increasing. It makes you think of the priorities for developments should now be reconsidered. I'm definitely gonna read any future updates! Yes, I find a good job from here. I am searching by Accounting jobs Melbourne and find some great site. This is one of this. You should visit this site to find a perfect job for you in Australia. Thanks everybody. Yes, I find a good job from here. I am searching by Administration jobs Melbourne and find some great site. This is one of this. You should visit this site to find a perfect job for you in Australia. Thanks everybody. Thank for your great Sharing. I have read your article. I think it is really helpful article. Really you are great. You create a knowledge house. Everyone can get more idea from your site. They can develop their skill. Thank again. Well and i am expecting more news from you. Because like posting with older one people won't get the updated news what are going. That's only i am expecting much more new posts from you. But i enjoyed much more here. found your content to be fantastic. Views expressed on this blog are mine and mine alone.